Getting new ATM card is so easy these day when you open an account with any bank. The ATM card will be offered along with your account number and passbook. There is no need to submit a separate application for getting new ATM card. However you are required to submit a request letter if you opened an account some few years bank and not got the ATM card at that time. 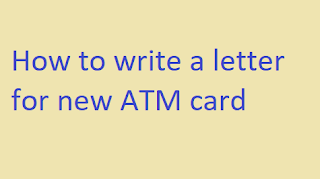 So you have an account with any bank but not having the ATM card so far and want one now, then it is a must to write a request letter and submit it to the bank manager. 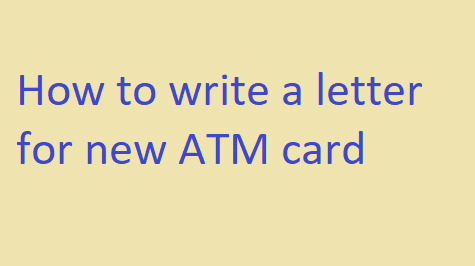 Here we have given a sample on how to write a letter for getting your ATM card. I have opened an SB account in your concerned bank in 2008. I didn't apply for the ATM card at that time. I have used to withdraw money and other transaction through the bank only. I find it very difficult to withdraw money these days as I have limited time now. So hereafter, I want to use ATM card for debiting money from my account. Hence I want to apply for the new ATM card and kindly request you to issue me a new ATM card as soon as possible. I have furnished my account details below. Thanking you! Note: You are request to make necessary modification in the above letter format to make your letter to match with your needs. If you feel what to write in case you have different situations, then leave us a comment below so that we help you write a meaningful letter for the same. Is the use of "have+used to" correct? I want to write an application to issue net banking, how to write? I want write a letter for apply ATM card but My age is less than 18 years.